February 14th is not only a day to express love for that special someone who makes you go weak in the knees, but a day to spread some love with all those people who make your life special. I have been blessed with some amazing ladies who have been an important part of my life for many years as I journeyed to become the woman I am today. Nothing can express how much a true friend is really worth, but I wanted to share a small token with some of these ladies who have been there for me through the thick and thin of life. Of course with any project I take on it usually requires a trip to Pat Catan’s or Jo-Ann Fabrics, sometimes both. 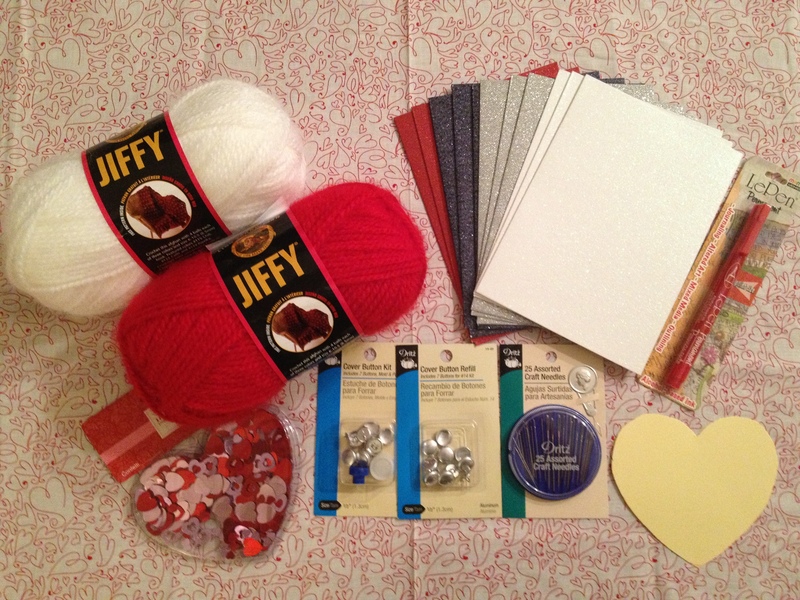 Supplies for making Valentine Day cards. I whipped up some cute heart button earrings using a whimsical heart pattern I found and a button press kit that is super simple to use. Everyone’s earrings had a unique heart pattern, which I loved since each lady is unique in their own lovely way. 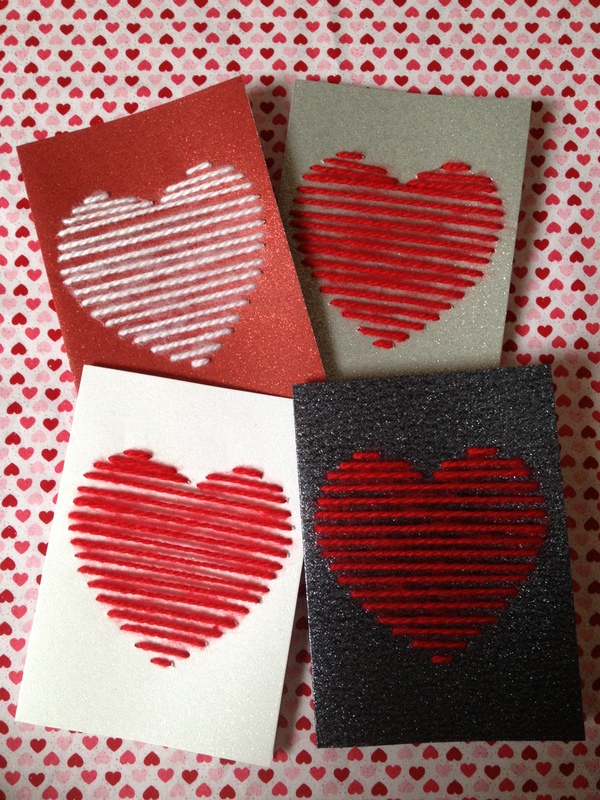 Then I hand stitched yarn hearts on some glitter card stock to give them a little extra love. Hand stitched Valentine Day cards. 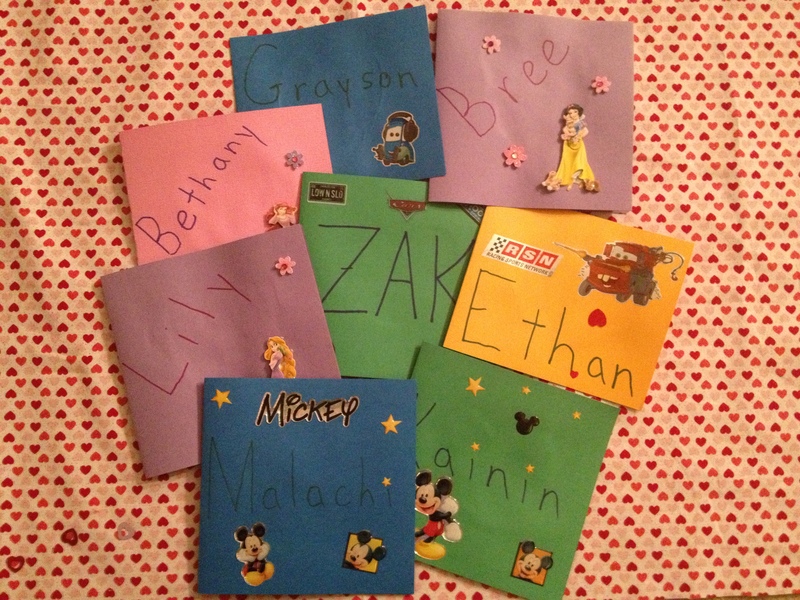 While I was hard at work heart stitching, we did not want to leave our favorite 8 little ones out, Lily, Bethany, Bree, Zak, Grayson, Ethan, Malachi and Kainan our adorable nieces and nephews. 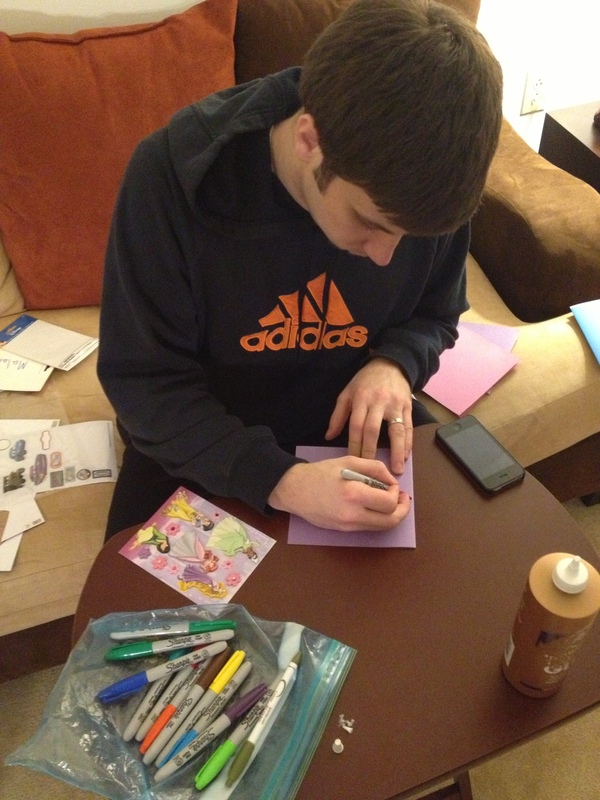 So Jared whipped out the markers and bought some princess and Lighting McQueen stickers to craft some unique valentines for each one. Jared getting his craft on. Then I took the earrings and attached them to a piece of edged card stock – ignore my horrible handwriting, I have never claimed to be an artist, just crafty. It’s also not Valentine’s Day without a corny phrase included! You’re As Cute As A Button. Jared also finished all of the cards for our crazy 8 and they looked super cute. I know the kids will love them. There is something so fun about getting a piece of mail when your 5 years old and have no idea what a bill is. Jared’s cards turned out great too! I hope that each little package brings the ladies a little bit of joy this Valentine’s Day. If you did not receive a valentine from me, please don’t take it personally. I wish I could send them to every single person that means something to me, but I would still be stitching yarn hearts and I kind of like my fingers. I hope that you have a few special people in your life that you can share a valentine with. It doesn’t always need to be a romantic gesture, but a small token of appreciation for anyone that makes each day more special because they are in it. It’s not to late to pick up a card or their favorite candy bar to share a little Valentine’s Day love. 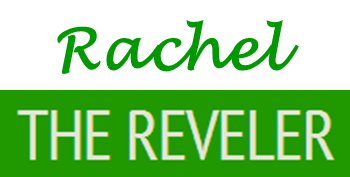 What is life without amazing people to revel with? 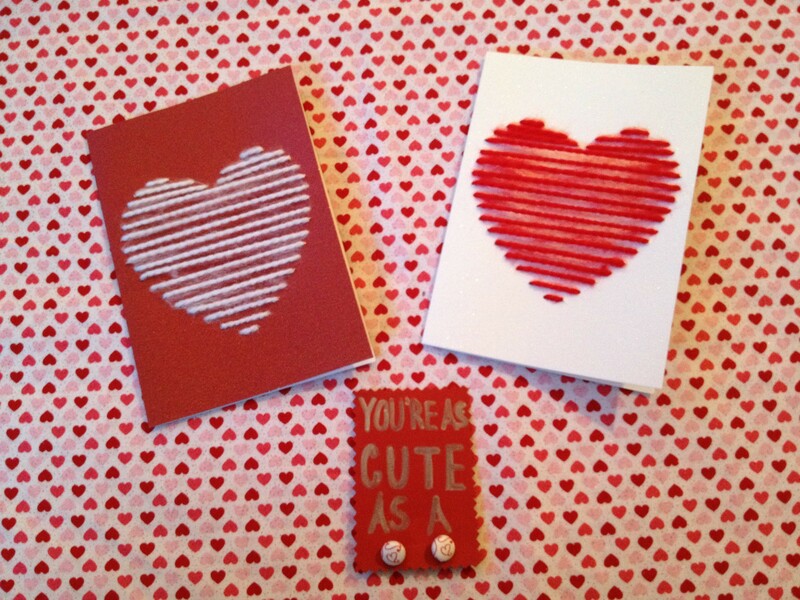 This entry was posted in Crafting and tagged Cards, DIY, Earrings, Friendship, Valentine's Day. Bookmark the permalink.